How deep cleansing with an oil and a face wash, with a weekly exfoliating scrub is helping my face. One of my beauty resolutions for 2015 is to remove my makeup fully, leave my face squeaky clean and apply a serum, a light moisturiser and anti-acne treatment - if required - each night before going to bed. For this, I have turned to the Japanese routine of double cleansing, where you first wash your face with a cleansing oil and then follow it up with a foaming cleanser. I also exfoliate once a week with a face scrub. I began with Klairs Gentle Black deep Cleansing Oil and Neutrogena Oil-Free Acne Wash before deciding that the second step could be milder, and opted for the BWC cleanser that came in my December Ipsy bag. The latter gave me the worst breakouts I have ever had - even on my forehead, where I never get breakouts. So I've stopped the foaming cleanser and stick to the oil and Cetaphil wash for now. 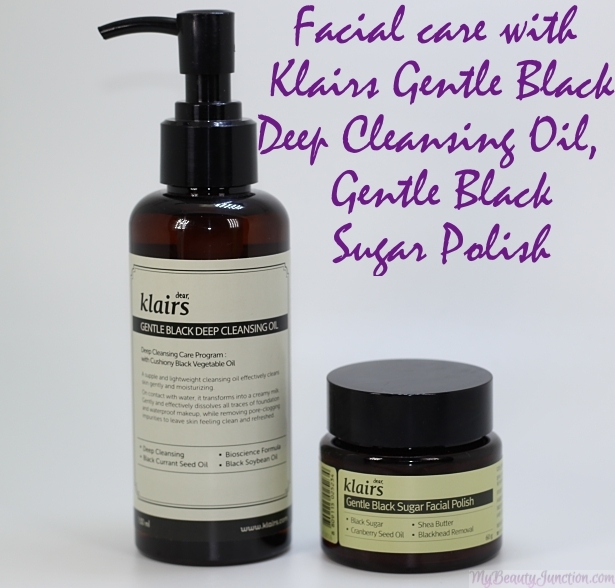 Here is more about the Klairs Gentle Black Deep Cleansing Oil and Gentle Black Sugar Facial Polish. Klairs Gentle Black Deep Cleansing Oil is a lightweight facial cleanser that is great for removing makeup and deep-cleansing the pores. Active ingredients are black soybean oil, black sesame oil and black currant seed oil. The bean oil controls oil production while sesame is an antioxidant and currant seed prevents dehydation. No sulphates, parabens or mineral oil. A few drops of the cleansing oil and only a trace of the lipstick remains - and this is seriously waterproof, stay-on lipstick, as you can read from my review here. Klairs Gentle Black Sugar Facial Polish is a mild exfoliating scrub that can be used once or twice a week. It is great for blackhead and whitehead removal. Active ingredients are black sugar, shea butter and cranberry seed. Black sugar removes dead skin; shea butter soothes dry skin while cranberry is an anti-ageing ingredient. The texture of the facial polish is non-greasy, relatively smooth and not too gritty so as to cause discomfort. It smells sweet and looks like thick caramelised sugar. It puts paid to all residue makeup and leaves the skin soft, smooth and glowing. No breakouts to report yet either. After six weeks' use in my cleansing routine, I know I will stick to cleansing oils forever - I am exploring the ritual of double cleansing, but need my forehead to calm down before I experiment further. Contrary to myth, cleansing oils do not make oily skin more oily or breakout-prone and act just like any other mild cleanser. As for the facial polish, I have been very remiss in not regularly using a scrub at least once a week - possibly because I did not want to worsen the breakouts. I love the Klairs products especially because the active ingredients are natural and because neither product has been tested on animals. Will definitely repurchase once I run out, especially the cleansing oil. You can get the deep cleansing oil here and the facial scrub here.